Beef is one of the best sources of well absorbed iron. 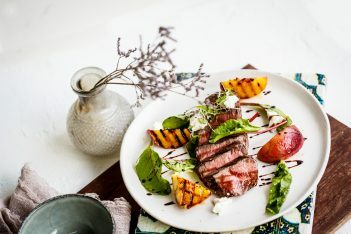 The Australian Dietary Guidelines recommends having 65g a day of red meat or 130g every second day because it is one of best sources of iron and zinc in the Australian diet. Therefore, eating beef 3 to 4 times a week helps to meet your iron and zinc needs. For energy – iron is essential for producing energy from food and contributes to the reduction of tiredness and fatigue. For your brain – iron carries oxygen to the brain and contributes to normal cognitive function i.e. ability to concentrate and learn. To fight infections – the immune system depends on iron to work properly. 1. Haem-iron, which is well absorbed by the body and only found in beef, lamb, pork, chicken and fish. The redder the meat, the higher the amount of haem iron. 2. Non-haem iron, which is less well absorbed by the body. Plant-based foods such as iron-fortified breakfast cereals, dark green leafy vegetables, wholemeal pasta and bread, legumes, eggs and nuts contain only non-haem iron. Eat beef 3-4 times a week; otherwise include plenty of other iron-rich foods every day. Maximise iron absorption from plant based foods such as breakfast cereal, legumes, nuts and spinach by combining them with either vitamin C-rich foods (e.g. oranges, strawberries, tomatoes) or foods containing haem iron (e.g. beef ). 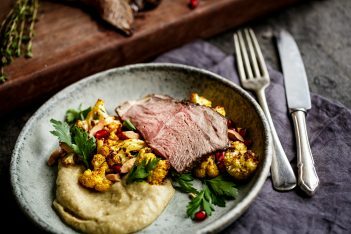 Beef and lamb are a great source of zinc and vitamin B12, but many people don’t know what these nutrients are and why they are important. Zinc is an essential nutrient that has many important functions in the body, including normal growth and development in children and supporting a healthy immune system to fight infections. The zinc found in beef is well absorbed by the body. Zinc is also found in wholegrain breads and cereals, legumes and nuts; however the zinc in these foods is less well absorbed by the body. Vitamin B12 is only found in animal foods, such as beef, lamb, chicken, fish and eggs. Vitamin B12 is important in the body for healthy functioning of our nervous and immune system as well as normal growth and development in children. On average, a 150g serve of beef provides over 40% of the Recommended Dietary Intake (RDI) for zinc and 85% of the RDI for vitamin B12.